Alberta Minister of Environment and Water Diana McQueen has promised public consultations in 2012 regarding how to reform the province’s water allocation system. This is welcome news, as Alberta’s current water allocation system is in need of repair, and a public process for changing it offers the potential to move towards innovative, sustainable solutions. Recognizing there is no panacea for Alberta’s water challenges, this report provides one resource amongst many to help the the Alberta public in engaging in the water allocation review. When determining the optimal water management system for Alberta, we must ask critical questions: Optimal for whom? For how long? At what risk or cost to others? Answering these and similar questions is a policy problem that requires the careful weighing of a range of policy options in light of existing obligations and rights. The way we understand Alberta’s water policy history is of critical importance because how we understand it affects how we interpret our problems and identify potential solutions. Alberta’s dominant water narrative dates back to as early as 1886. Informed by the allocation systems in numerous jurisdictions, legislation first crafted at the end of the 19th century vested water as property of the Crown, based allocation on a system of first-in-time, first-in-right (FIT-FIR), and granted water licences with seniority. Commitments to both community and distributive justice over private property were pillars of this early development. As early as the 1920s, Alberta’s allocation system showed signs of stress. Passage of the 1999 Water Act, a patchwork attempt to update 19th century legislation to the 20th century context, introduced key innovations, including the creation and implementation of watershed management plans and the introduction of market transfers and an optional 10% holdback. These and other changes eventually resulted in closing three of the South Saskatchewan River Basin’s four sub-basins to new allocations. While the Water Act created room for innovation, it ignored other critical water narratives, most notably the water narratives of First Nations peoples and the environment itself. Despite having water claims predating the entire allocation system, the priority of First Nations in Alberta’s water allocation system has not been recognized, and steps must be taken to remedy this reality. Likewise, the narrative of the environment is under-represented, through a false division between surface and groundwater, the assumption that water in situ is not in use, the granting of licences in absolute quantities, and separating water rights from responsibilities to concerns such as water quality. Three reports released by the provincial government to guide its allocation review all classify Alberta’s water allocation problems in primarily economic terms. The recommendations to move to water markets are not unique to Alberta, but reflect a broader trend of devolving decision-making from the state to lower-level actors. But the current licensing regime makes it a problematic base for implementing a water allocation market, and in some respects water markets are opposed to the very ideas that lay behind Alberta’s existing rights regime. The very classification of water allocation problems as economic constrains the options available to the Alberta policy community, a problematic direction given the unpredictability of future conditions. There is no clear argument that either ‘efficiency’ or the satisfaction of ‘preferences’ through markets can solve Alberta’s water problems. Looking at evidence from other jurisdictions, and considering the flaws and exclusions of Alberta’s existing allocation framework, it becomes less appealing to classify Alberta’s water allocation problems as economic, or to expect a water market to solve them. 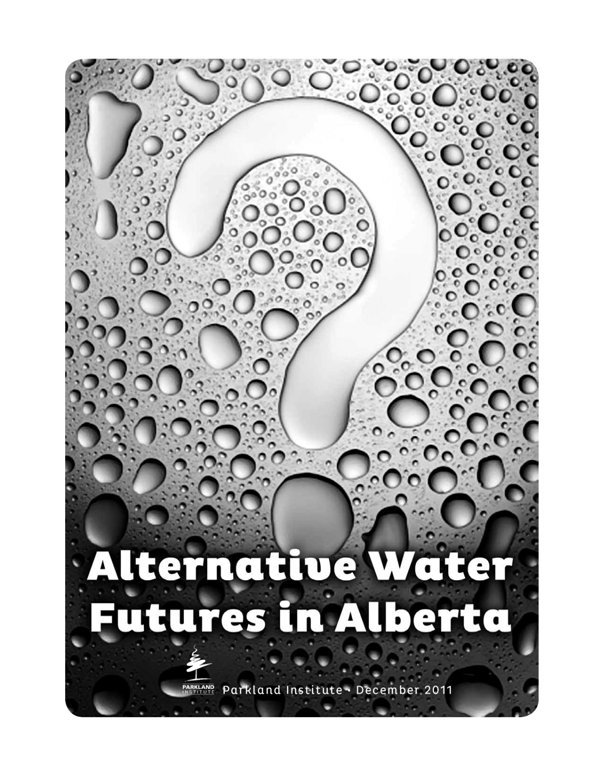 There are at least two — and likely many more — alternate ways of classifying Alberta’s water problems that provide a broader set of social principles upon which solutions to allocation dilemmas may be found, and which open up policy options for dealing with future uncertainties: looking at water as a common-pool resources or as a public trust. Rather than looking for ‘silver bullet’ solutions, common-pool resource systems pay special attention to how we design water governance institutions to deal with specific and often localized problems, and recognize that if individuals (or corporations) pursue only what is best for them, it may come at a greater cost to the community. Unlike economic systems, common-pool resources systems work to accommodate rights that may be private, public or held in different forms of communal tenure, and therefore allow the rights of communities such as First Nations peoples to be accommodated in the system. Several key principles for designing successful common-pool governance systems are already at play in Alberta, such as using multiple scales of decision making to govern large systems and allowing most resource users to participate in devising rules. The principles used to design common-pool governance systems are not prescriptive, but emerge from collective-choice decisions about how to achieve the requirements of social equity and environmental protection—both of which are central to economic prosperity in Alberta. The idea that water should be held as a public trust resonates strongly across many water use traditions, including the broadly held Canadian notion that water is property of the Crown. To classify water allocation problems through the public trust lens is to suggest that there are social principles that work out of four beliefs: (1) that the public benefits mightily from private development, but that the public interest is in fact greater than the sum of private interests; (2) a belief that property ownership must be respected but that property rights in water are not absolute but can be regulated and adjusted in reasonable ways for the good of the citizenry as a whole; (3) a belief that wasteful uses of public resources are wrong; (4) a belief that rivers and canyons are more than commodities, that they have a trace of the sacred. These four beliefs about water’s central importance are reflected in the history of Alberta’s own legal tradition. Viewing Alberta’s water allocation problems through the lens of common-pool resources or the public trust entail both limits and opportunities, and open up a range of options to amend the existing water licence system. What each offers is a way to think about water allocation in Alberta in a way that does not narrow future governance options unnecessarily. • coupling allocation quantities with responsibilities regarding quality to prevent degradation of surface and groundwater.